After a week in Ft. Lauderdale we were ready to leave. On Thursday morning, November 29, 2018, at 0647 we dropped the lines at the New River Docks. Since the railroad bridge goes down frequently and the two bascule bridges on the river we have to ask to be raised are closed between 0730 and 0900 on weekdays, we needed to plan carefully to get out to the ocean. We waited for the 0730 opening of the 17th Ave Causeway bridge and then were out on the ocean. Mark finally got the watermaker working so on the way to Miami we filled some gallon water jugs for drinking. We left Ft. Lauderdale with our three water tanks (120 gallons) full, so no need to make water for them yet. It was a beautiful day with wind under 5 kts and following seas with a small swell. 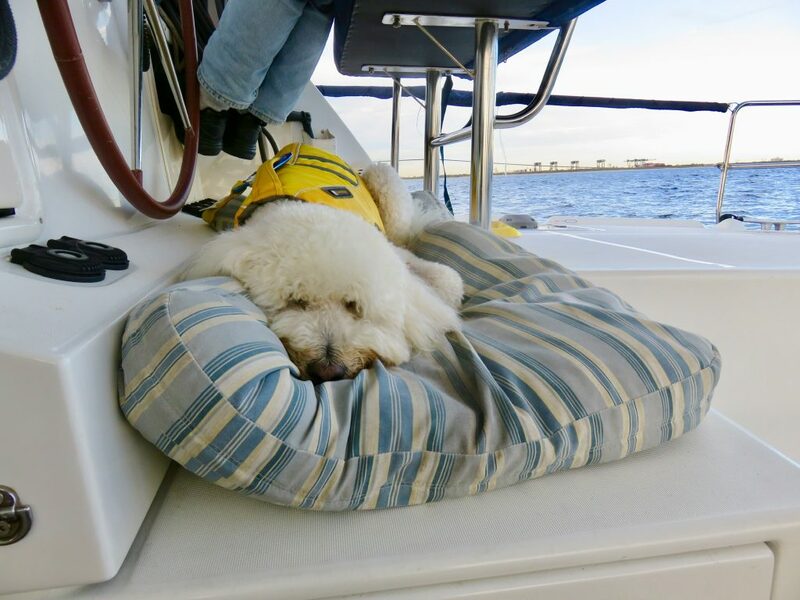 Proof that it was comfortable was that Sailor stayed under the helm seat through the Port Everglades Inlet and all the way to Miami. He has quickly remembered what goes on when we are sailing. He recognizes the difference between the ocean (which he usually doesn’t like), the ICW and the New River and when we leave the ocean through an inlet he quickly realizes that it is “safe” to go outside. However, this time he was fine staying outside through the Pt Everglades Inlet where amazingly we were the only boat in it and then again at Government Cut into Miami where once again we were the only boat. That was extremely unusual. 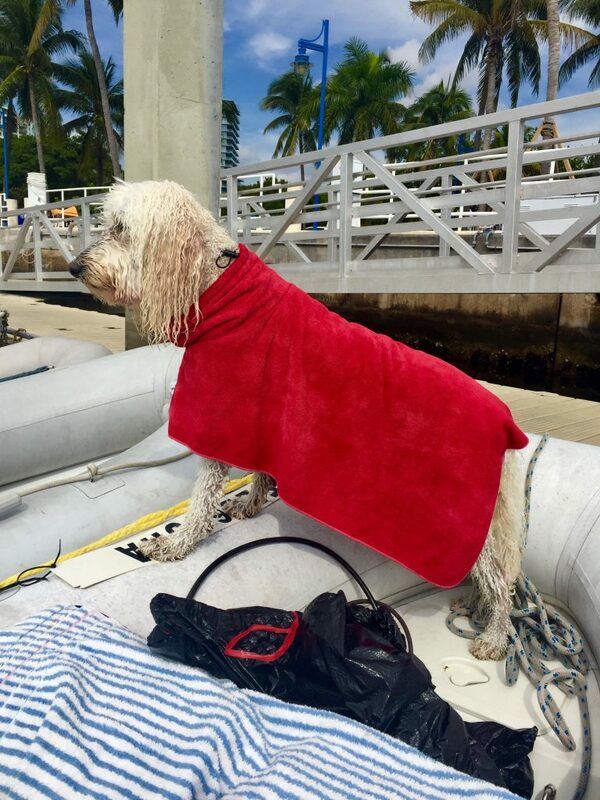 The picture below is Sailor on the ocean just after we left Ft. Lauderdale. We stayed about a mile offshore the whole way following the coast south. After entering Government Cut we motored to Crandon Park Marina in Biscayne Bay where we got fuel. We then continued across the Bay to the Dinner Key Mooring Field and picked up Ball 84 at 1347. We came to Miami without our jib sail on and will be getting the parts for the furling mechanism in about two weeks. 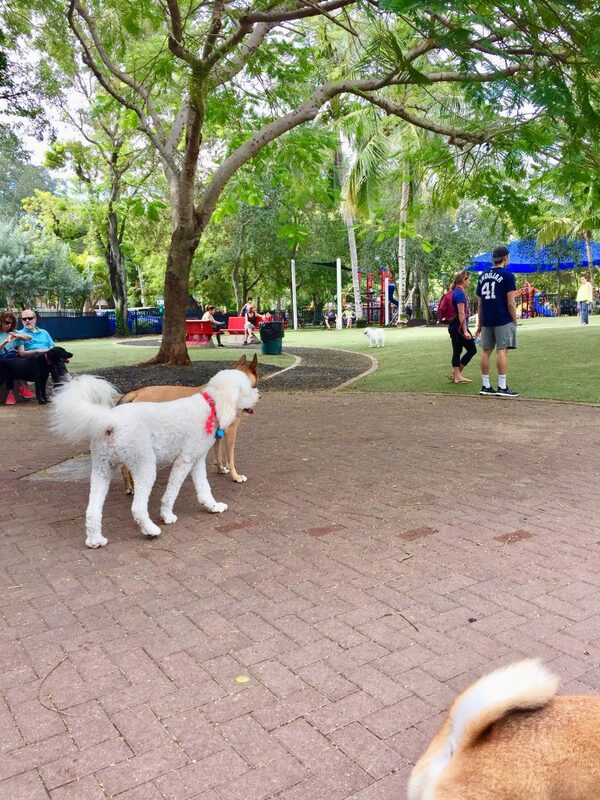 In the meantime we will enjoy walking around Coconut Grove which has a small downtown area with restaurants, stores, and coffee shops. Sailor is thrilled that we can walk to the best dog park we’ve ever seen, Blanche Park. 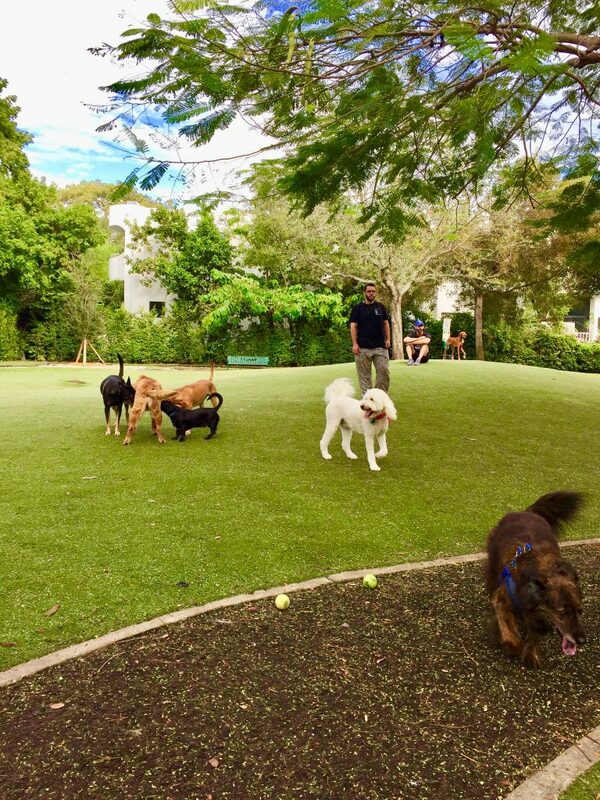 There is no dirt, just AstroTurf, paved walkways, lots of benches to sit on in the shade, balls for the dogs and best of all the dog owners watch their dogs and the dogs are well behaved. Sailor goes there every morning and then goes ashore again for a shorter walk in the afternoon. It gets dark early in December so he doesn’t get a nighttime walk since we have quite a long dinghy ride in the dark to the dinghy dock at the marina. Below are some pictures of Sailor enjoying the area. 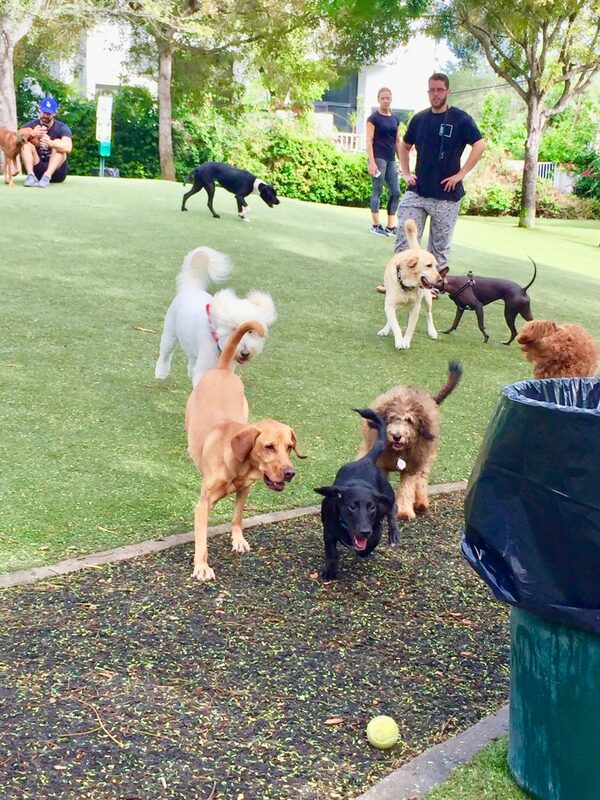 Sailor always has fun at Blanche Park. 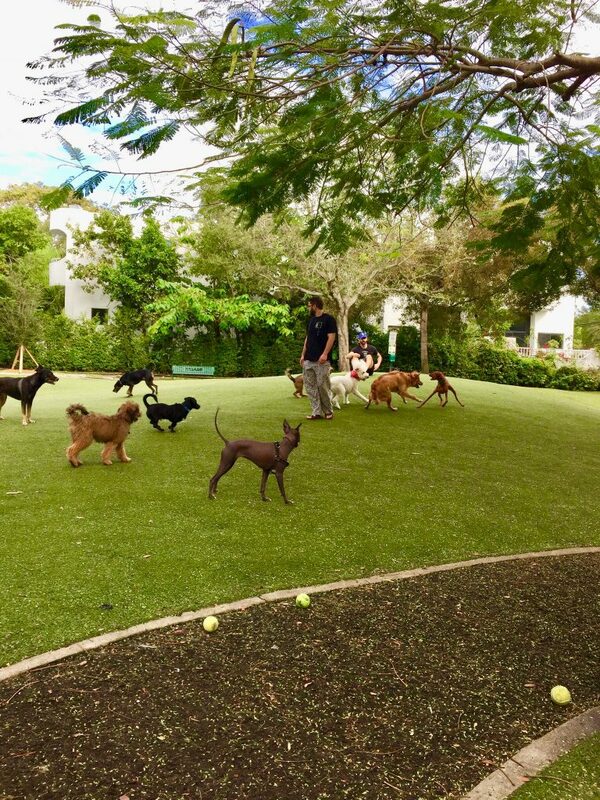 There is a dog park and a separate fenced playground for children. 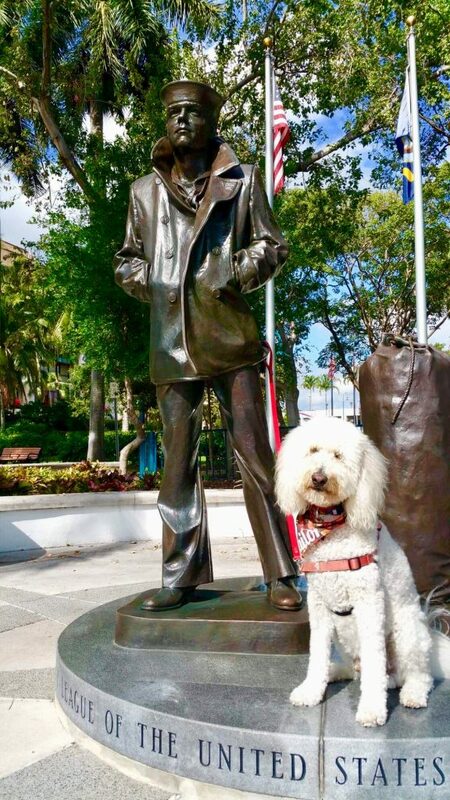 Sailor is standing by a fountain in the shopping/restaurant area of Coconut Grove in the photo below. The area that had a two story outdoor mall with a theater, restaurants like Cheesecake Factory, stores and a large Starbucks with a lot of outdoor seating is gone. A highrise building is going in its place. 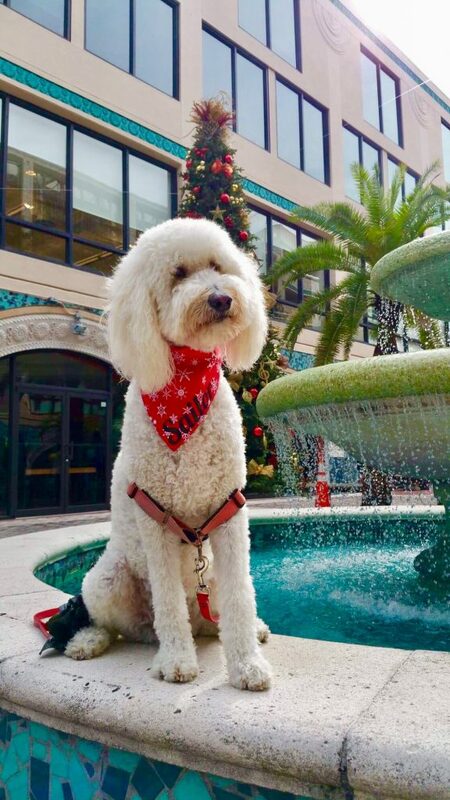 We will miss that area of Coconut Grove this time of year since it was always decorated beautifully for Christmas and had a nice place to sit outside. Sailor is posing in this photo next to another sailor. This is one of the many peacocks that can be seen around the Coconut Grove area. We can walk to two nice, although pricey, grocery stores, Milans (an IGA) and Fresh Market. Since all we need to buy is fresh produce, either one works for us. One advantage of being on a mooring ball is that you get to use the marina facilities. When we go to the marina office building we can use their free wifi, a nice laundry room, and great showers and bathrooms. While we can easily shower and wash clothes on the boat, we would have to also make water or bring it in five gallon jugs from the marina. We’ve decided we’ll take showers in the morning at the marina and wash our clothes there to save on water and power on the boat. 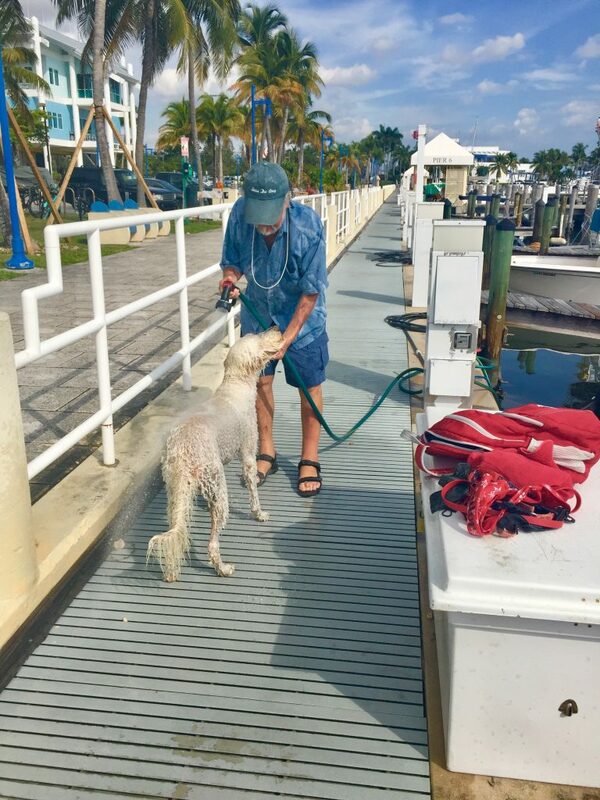 Another way to save water is to give Sailor a bath using the free water at the marina dock. 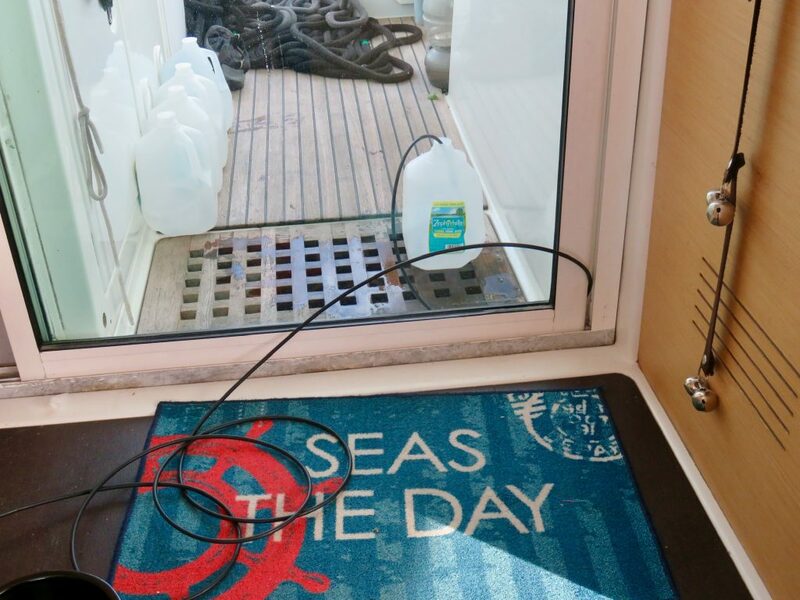 We have to use the Honda generator plugged directly into his blow dryer when we get back to the boat. If we don’t blow him dry he gets very matted. 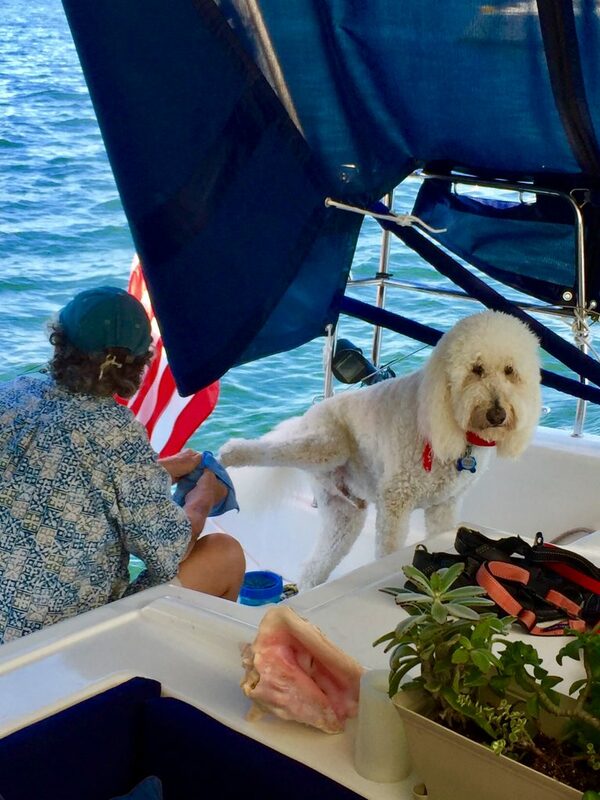 Also, to keep the boat clean, since his feet get very dirty walking on the city streets, we use a “paw plunger” to wash his feet after he gets out of the dinghy. 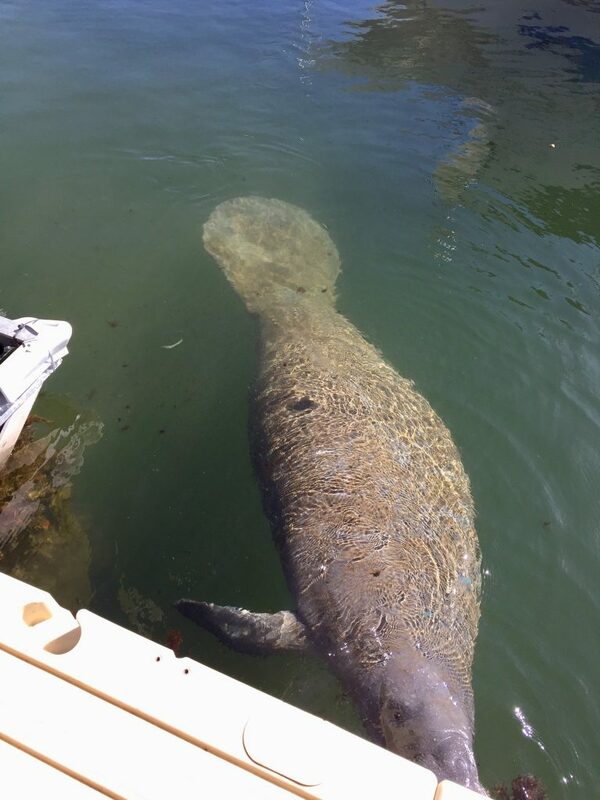 We love seeing dolphins but when we see manatees they are usually under water and not very visible. Also they aren’t as interesting to watch as dolphins since they usually just float around. Dinner Key Marina has a manatee named Puffy who has lived here for several years. In this photo Puffy is cleaning the dinghy dock so we were able to get a close up view. After our jib furler arrives and is installed we will leave for Bimini or possibly Great Harbour Cay in the Berries at the next good weather window. We hope to be able to do this before Christmas and will then head straight to the Exumas and Georgetown. However, the most dangerous thing on a boat is a schedule so in reality we’ll get there when we get there. 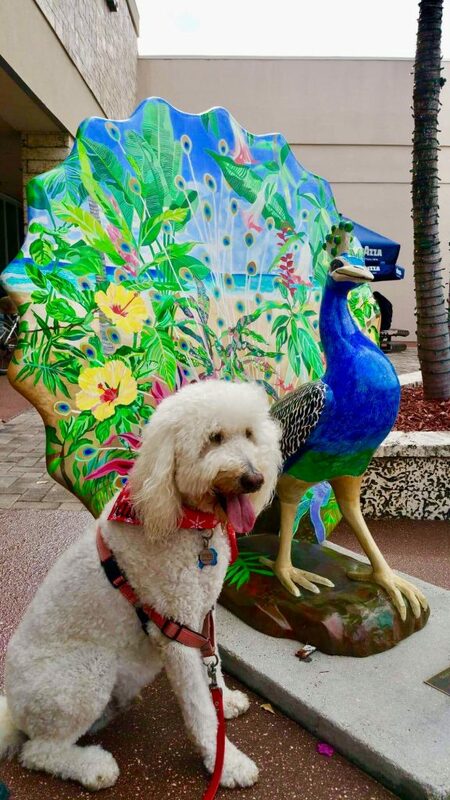 This entry was posted in 2018-2019 Bahamas Cruise, Florida, Sailor Doodle and tagged Boat Repairs, Coconut Grove, Dinner Key Mooring Field, Miami, watermaker on December 4, 2018 by Jan.